What makes anything a viable alternative is the integrity of your approach to it...it doesn't have anything to do with the materials, or the style...it is a kind of energy that comes into the particular sequence of events. Color photogravure with burnishing, soft ground etching and spit bite aquatint. Image size: 32½ x 26"; paper size: 41½ x 34". Edition 10. Image size: 32 ½ x 26”; paper size: 41 ½ x 34”. Photogravure with hand coloring by the artist; from a series of 23. Image size: 32½ x 26"; paper size: 41½ x 34". Photogravure with hand-coloring by the artist; from a series of 23. Hard ground etching on gampi paper chine collé. Image size: 4 x 20 1/4"; paper size: 11 1/2 x 27". Edition 10. Spit bite aquatint printed on gampi paper chine collé. Image size: 12¼ x 12¾"; paper size: 19¾ x 19¾". Edition 15. Image size: 12½ x 12"; paper size: 20 x 19". Edition 15. Soft ground etching printed on gampi paper chine collé. Spit bite aquatint printed in green and brown on gampi paper chine collé. Soft ground etching wih photogravure printed in gray and umber on gampi paper chine collé. Color spit bite aquatint with burnishing and soft ground etching printed on gampi paper chine collé. Image size: 42½ x 35½"; paper size: 51¼ x 40¾". Edition 25. Hard ground etching with drypoint and aquatint. Image size: 2 x 29"; paper size: 6¾ x 33". Edition 10. Color aquatint with flat bite etching, soft ground etching and drypoint. Image size: 42½ x 35½"; paper size: 51¼ x 40¾". Edition 35. Aquatint with flat bite etching and drypoint. Image size: 8 x 41¾"; paper size: 13¾ x 47¼". Edition 25. Image size: 12 x 5½"; paper size: 23 x 16½". Edition 15. Woodcut with hand-coloring by the artist. Image size: 74¼ x 23"; paper size: 76¼ x 25". Edition 25. Aquatint with soft ground etching and burnishing. Image size: 45 x 36"; paper size: 54 x 40½". Edition 10. Image size: 45 x 36"; paper size: 53½ x 41". Edition 6. Aquatint with soft ground etching, burnishing and hand-coloring by the artist. Image size: 45 x 36"; paper size: 54 x 40". Color aquatint with soft ground etching and drypoint. Image size: 45 x 36"; paper size: 52¼ x 41½". Edition 25. Soft ground etching printed in blue and red. Image size: 12 x 9"; paper size: 19 x 15". Edition 25. Image size: 25 x 2"; paper size: 39 x 8¼". Edition 35. Image size: 45 x 36"; paper size: 51½ x 41¾". Edition 50. One from a series of 46 monoprints with soft ground etching. Image size: 20¾ x 28¾"; paper size: 26¼ x 37". Image size: 37 x 28¾"; paper size: 26¼ x 26". Image size: 3 x 29"; paper size: 10½ x 39". Edition 35. Soft ground etching and drypoint printed on chamois. paper size: 37 x 29". Edition 10. Image size: 21 x 27"; paper size: 22½ x 29½". Edition 200. Aquatint with soft ground etching. Image size: 45 x 36"; paper size: 49 x 40". Edition 15. Image size: 28 x 22"; paper size: 32½ x 26". Edition 25. Published by Crown Point Press and printed by Stephan Thomas. One of a series of 32 monotypes; 16 on paper (shown here); 16 on chamois. Image size: 23 x 30"; paper size: 32 x 39". Image size: 22 x 28"; paper size: 26 x 32". Edition 10. Image size: 11½ x 10"; paper size: 15 x 13". Edition 15. In the catalog essay for William T. Wiley’s 2005 print retrospective at the Smithsonian American Art Museum, co-organized by the Corcoran Gallery of Art in Washington, DC, curator Eric Denker wrote, “There is an innate directness to Wiley’s work – he applies his inherent wit and creativity to basic materials to explore very humanistic themes. Wiley’s assured draftsmanship and quiet humor draw us into his world, where we pause to marvel at the metamorphosis of symbols and words and images.” Wiley’s work is inhabited by a democracy of images. Since the 1960s, he has drawn from sources as diverse as the I Ching, personal and universal symbols, and ancient Roman history. Wiley began making art when abstract expressionism ruled the art world; over the course of his career he has rejected minimalism, conceptual art, and other trends. Instead, he has made his way by developing a style all his own. His irreverent art can seem spontaneous and offhand, but Wiley is deeply committed to the overall meaning of each work. Robert Johnson, curator of Wiley’s 1996 show “Nothing Lost from the Original: William Wiley Looks at Art History” at San Francisco’s de Young Museum, wrote, “When you first see the works, you are struck by the artistry, the sheer beauty. Then, when you read them more, you start to realize that there’s a kind of deadly seriousness about the whole thing.” Because of his work’s thoughtfulness, and its distinctive balance of the personal and the political, eminent artists, including Bruce Nauman, his student at the University of California at Davis from 1962 to 1973, count him among their major influences. Wiley’s work spans painting, sculpture, watercolor, set design, and filmmaking. 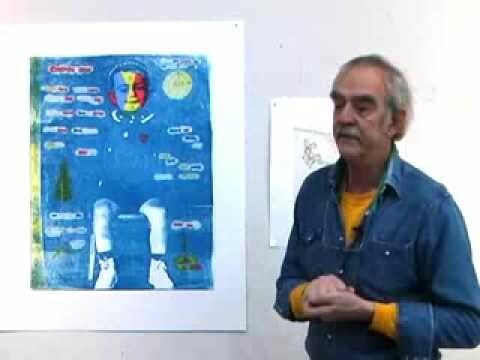 He made his first prints in 1972 at Landfall Press in Chicago, where in 1989 he was the subject of a solo exhibition, “William T. Wiley: A Decade of Prints”. A committed printmaker, he has worked at Crown Point Press frequently since 1978. He participated in the group exhibition “Committed to Print” at the Museum of Modern Art, New York, in 1988. Wiley was born in Bedford, Indiana, in 1937. He attended the San Francisco Art Institute, where he received his BFA in 1961 and MFA in 1962. His first solo exhibition was held at the San Francisco Museum of Modern Art in 1960. Since then, his work has been brought into many collections, including the Los Angeles County Museum of Art, the Museum of Modern Art in New York, the San Francisco Museum of Modern Art, the Art Institute of Chicago, the Walker Art Center in Minneapolis, the Whitney Museum of American Art in New York, and the Stedelijk van Abbe Museum in Eindhoven, The Netherlands. He received a Purchase Prize from the Whitney Museum of American Art in 1968, a Guggenheim Fellowship in 2004, and a Lifetime Achievement Award from the Southern Graphics Art Council in 2005. Artist William T. Wiley discusses working at Crown Point Press in San Francisco, 2006.